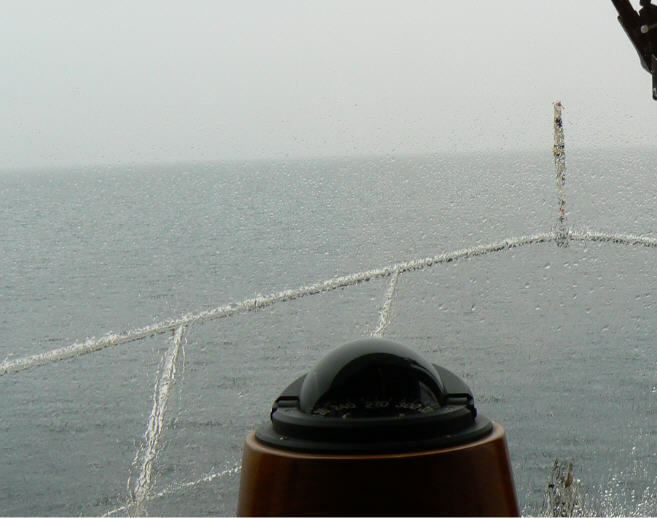 We spent nine days in Port Angeles, doing final chores and waiting for a weather window. The time went fast and we accomplished what we needed to do. We met some nice folks on the dock. One couple are graduates of CMA. Bruce and they had a great time comparing stories and naming names. Our friend Wally stopped by for a couple visits. On one of them he brought us a very nice gift. 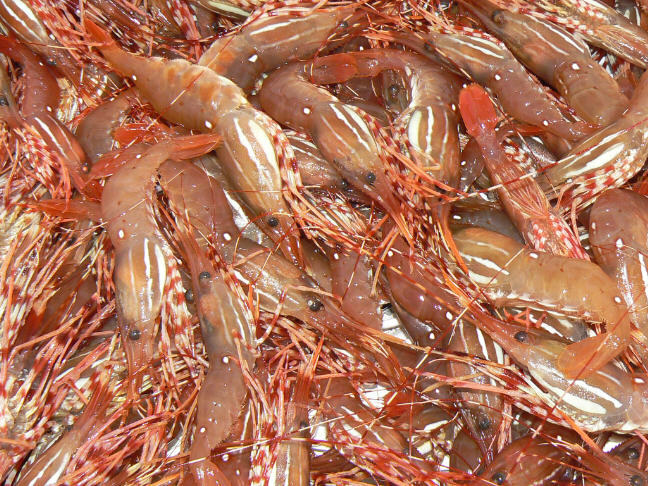 Fresh, live spot prawns. We had some for dinner the other night. Yum! Thanks, Wally! We hope to see you much further south this winter! Yesterday we moved to Neah Bay, from Port Angeles. It was a gray and gloomy trip. We left early, with very low clouds – at times light fog, and light rain. We seemed to be by ourselves. I have had a hard time deciding if it was a fitting condition since we are saying our goodbye to the Pacific NW – at least for the time being. Gloomy weather seems to re-enforce our decision. On the other hand a beautiful sunny day could have begged us to stay. 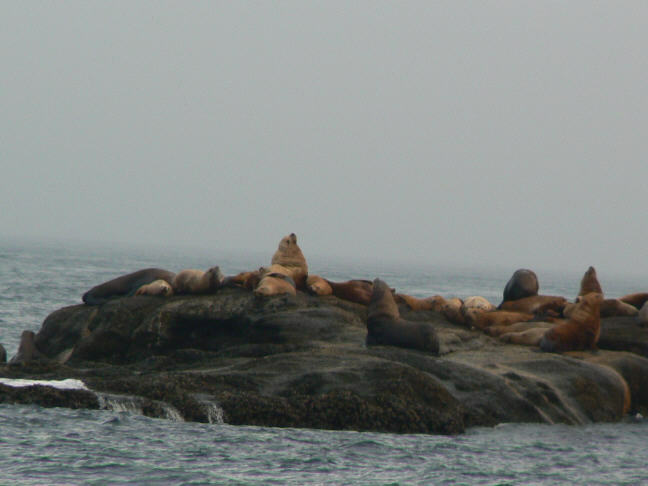 These sea lions, on a rock just off Tatoosh Island, did lift their heads and note our departure. So long, boy and girls! This is looking out to the Pacific Ocean through Hole in the Wall. Remember how I have posted pictures showing a difference in the sea state on the Pacific Ocean and Strait of Juan de Fuca side? Well, there isn’t much to show today. Have any of you been checking the weather sites and predicting our voyage plans? 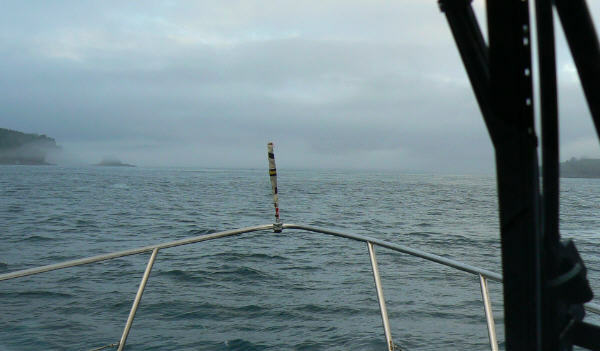 We were up and underway by 0631 this morning from Neah Bay. Today looks much like yesterday, only we have some mild rolling due to the cross swell coming from the SSW and WNW. The swell is running three to four feet in each direction, giving us that beam-y ride that causes us to roll from side to side. We are doing fine, bracing some, but nothing to get too excited about. Sea Lion Rock was abeam to port at 1045. Our destination is Grays Harbor. Forecasted conditions are for the seas to lay down. We have light and variable winds. This leg is about 105 miles. We aren’t making as good a time as we would like. We have a negative one knot, or so, current working against us. 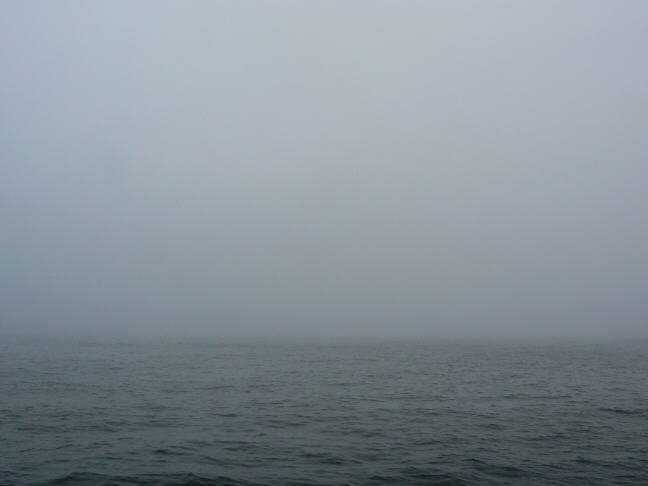 We are about 3 miles off shore, and it is not visible at this time. Maybe not gray – more whitish gray -maybe even whiter – is that better? Not really. Would somebody please go put on a pot of stew and bake some chocolate chip cookies? It’s just that kind of day! Meanwhile – It’s just us and the birds out here – Underway and Headed South! This entry was posted in 2010, Voyages and tagged Baby Boomer Lifestyle, Coastal Cruising, Cruising, Travel, Voyaging, Weather Forecasting by Angela. Bookmark the permalink. Hi Angie !! Brian and I had a lot of fun meeting you two on the docks of Port Angeles and reminiscing with Bruce about Cal Maritime. Thanks for all the helpful info about your navigation program. Love your website, I’ll be checking back in on you so I can follow along on your adventures..
Here’s to smooth seas and tons of sunshine as you cruise south. We’re reveling in late summer sunshine in Campbell River for a few days, waiting for Mom to arrive for a week in Desolation Sound. Thanks! So sorry we didn’t connect this year. Come find us this winter! Will make some cookies this afternoon. Thinking of you!